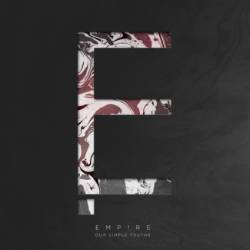 English alt-rock act EMP!RE return with their new EP Our Simple Truths set for release on the 20th May. Following on from their superb mini album Where The World Begins (2013), the EP shows the band in their finest form. Blending crushing metal riffs with a big alt-rock sound, jamming as many infectious hooks in as possible; all with a wide ranging and excellent vocal and you can’t help but think EMP!RE are onto a winner. If you thought the band’s previous material verged on mainstream rock, then Our Simple Truths propels the band right into the middle of the mainstream. Here everything is a little more polished and even more accessible. It’s the kind of entry level rock band your parents could fall for. ‘Hands and Tongues’ gets the EP of to a storming start, the big crushing riff combines perfectly with the big chorus and commanding vocal of Joe Green, it’s accessible yet has enough of an edge to it. ‘Sparrows’ sounds like a band that are confident and fully enjoying the music they produce. Although it’s a band doing exactly what they want it does seem to lack a little direction, ‘Sights’ however is EMP!RE at their best, combining the sound from their previous releases with something a little more commercial. It’s an infectious number and sets the scene for the final two tracks ‘Patchwork and Bone’ and ‘Sweet Apollo (Brighter Than The Sun)’ which see the band at their most mainstream and most accessible. The latter is especially notable. If there’s ever going to be a moment that EMP!RE transition to popular mainstream rock then this is it.